What are the best jewelry pieces for men and how should you wear them? For starters, you need a good watch, and you can collect a variety of pieces as you build your wardrobe. Watches are a practical and necessary accessory to wear. A beautiful watch makes you look professional and becomes a good conversation piece. Men's shoes are easily noticed and judged by others, and this actually applies to the watch you wear as well. So, choose carefully when you purchase a watch. You don't need to buy a very expensive brand as there are well-designed and affordable pieces available. How do you wear watches the right way? Check that the design of the watch you wear matches your outfit for the day. If you're wearing a suit or business outfit, wear a leather or metal watch. Reserve casual or sporty watches for days when you wear jeans and rubber shoes. ●	Choose a tie link that would match your watch or wedding band. ●	You may also select a tie link that complements the color of your cufflinks. ●	If you're feeling adventurous, you can accentuate a plain tie with an interesting tie clip, such as pieces with precious stones or gems. The key is to choose one attractively colored gem as an accent on your tie clip and to keep the rest of your jewelry simple and classy. 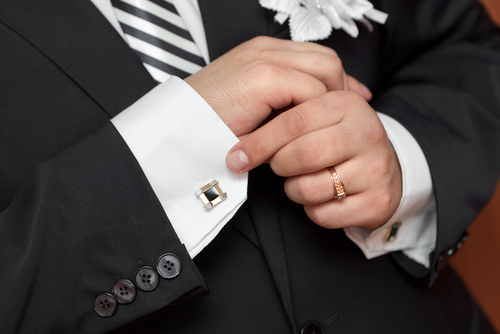 Cufflinks are staples in a man's wardrobe. They make you look sharp. Make sure your cufflinks go well with your watch and your tie links. To be unique, you can purchase personalized silver- or gold-plated cufflinks engraved with your initials or monogram cufflinks. Men's necklaces are usually made of either gold or silver metal. Gold necklaces are more eye catching and can be worn for evening occasions, although a thin gold men's chain may be tastefully worn during the day or to work. 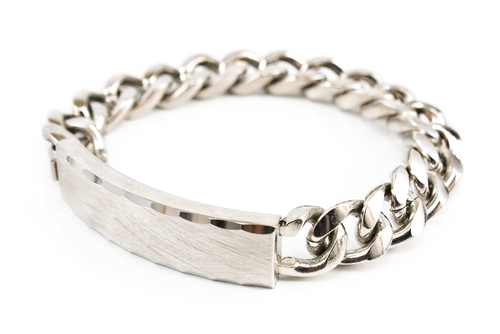 Silver chains are more sedate and give a minimalistic look. If you're wearing bright shirts or light colors, complement these with a silver necklace, instead of gold. To give your ensemble extra individuality, choose a monogram block necklace or pendant. Check out here for the variety of necklace designs you can choose from. The best time to wear a necklace is when you're sporting a simple outfit. It's the perfect accessory to dress up a plain black, white, or gray shirt, for example. Wear your necklace with a plain shirt, jeans, and trainers ensemble or with a sporty blazer, trousers, and loafers combination. It's good to also match the color of your necklace with the color of your wedding band, which you wear all the time. If you plan to wear a necklace, just wear a watch and one ring with it. Don't overdo the jewelry! ●	Because you wear a bracelet quite close to your watch, you have to match the color or metal of your bracelet with the color of your watch – even if you wear them on different wrists. Mismatching metals will be distracting and detract from your overall look. ●	Keep your wrist accessories to a minimum as well – just a watch and one bracelet. Bedecking your arm with several bracelets just doesn't work for men. ●	For special occasions, you may sport a tastefully designed men's bracelet with diamonds on it. ●	Save plain bracelets for hanging out with your friends after work or for going to clubs and parties. ●	At work, it might be best to just stick to wearing a nice watch. For many men, a wedding band is a constant. You can actually add one or a couple more rings, depending on your style and preferences. Many jewelry brands actually make a separate collection for men's rings. If you're just about to start adding rings to your wardrobe, start with a striking piece (in addition to your wedding band). You may also opt to wear your fraternity ring to gatherings with your friends or wear a symbolic signet ring that matches the color of the rest of your jewelry. ●	Stick to small studs, and avoid wearing them to work. ●	If you work in a creative company where the attire is not as formal, you may be able to pull off wearing an earring on one earlobe. ●	You may also wear an earring on weekends when you wear more casual clothes or when you go to parties and clubs. ●	If you're wearing a suit, it is best to leave the earring at home. Use good judgment when making a decision. ●	Again, match your earring with other pieces of jewelry you will wear. Jewelry for men follows simple rules. Keeping your overall look simple, choosing jewelry pieces that match in color, and knowing when to wear them will make you stylish and elegant at all times.